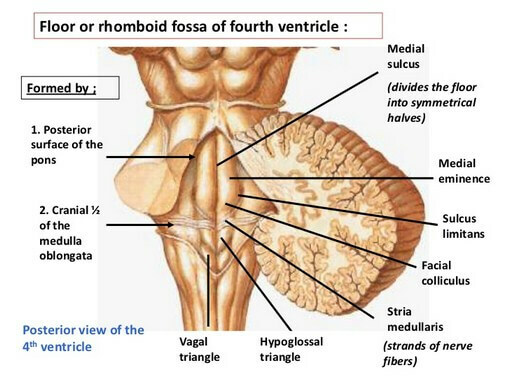 Floor of fourth ventricle is formed by dorsal surfaces of pons and upper-half of medulla oblongata. It is called rhomboid fossa because it is rhomboid in outline. The area is outlined superolaterally by superior cerebellar peduncles and inferolaterally by inferior cerebellar peduncles. At the inferior angle, on either side of midline, floor is limited by gracile tubercle and superolateral to it lies cuneate tubercle. Whole area of rhomboid fossa is lined by ependyma, just beneath which lie different areas of gray matter, which are more precisely some cranial nerve nuclei. Floor of fourth ventricle is divided by a vertically running midline sulcus called median sulcus. Each half of the floor is again subdivided into a medial part called medial eminence and a lateral part called vestibular area by a narrower sulcus limitans. Just above the horizontal line of pontomedullary junction, medial eminence presents a round elevation called facial colliculus. It is so called because, efferent facial nerve fibers from motor nucleus of facial nerve loop around abducens nucleus beneath this bulge. Above the level of facial colliculus, sulcus limitans presents a small depression called superior fovea. Above the level of superior fovea, sulcus limitans becomes flattened and forms lateral limit of floor of fourth ventricle. This area is bluish gray in color and named locus coeruleus (to be pronouncedceruleus). Beneath this area, the group of neurons, containing melanin pigment, is called substantia ferrugenia. These neurons are rich in noradrenaline (norepinephrine). Lateral to sulcus limitans, rhomboid fossa presents a wide triangular area known as vestibular area or vestibular triangle. Vestibular nuclei are situated beneath this area. Just below the level of facial colliculus, fine strands of nerve fibers are found to pass beneath ependyma, in mediolateral direction, from median sulcus across medial eminence towards lateral angle. These are known as stria medullaris. These are efferent fibers from arcunate nucleus present on ventral aspect from pyramid. These fibers initially pass in ventrodorsal direction across whole thickness of medulla oblongata to reach rhomboid fossa, where they bend at right angle and cross the median sulcus to pass horizontally towards lateral angle. Finally the fibers reach opposite half of cerebellum via inferior cerebellar peduncle. Below the level of stria medullaris, medial eminence presents a triangular area with apex directed downward. This area is known as hypoglossal triangle beneath which lies nucleus of hypoglossal nerve. Lateral to hypoglossal triangle, lower end of sulcus limitans presents a small depression called inferior fovea. Below inferior fovea, lateral to apical part of hypoglossal triangle, a smaller triangular area is present with the apex directed upward. This is called vagal triangle as beneath this area lies dorsal nucleus of vagus. Inferolateral to vagal triangle, just above the upper end of central canal of medulla oblongata, anarrow area is called area postrema. This narrow area contains some neurons covered by thickened ependyma. Area postrema is separated from vagal triangle by a ridge of ependyma called funiculus seperans. Lower angle of floor of fourth ventricle looks like a pen’s nib for which it is known as calamus scriptorius. Following features are not parts of floor of fourth ventricle, but are closely related to it. Inferolateral boundary of rhomboid fossa, which is formed by inferior cerebellar peduncle is crossed by tranverse ridge of white matter called tinea. Tinea from both sides converge inferomedially towards the lower apex of fourth ventricle to form a thin fold called obex. It forms the roof of lower apex of fourth ventricle.